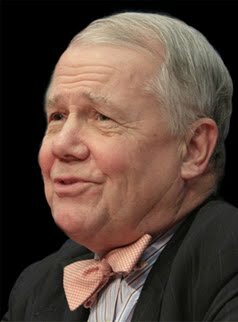 Jim Rogers is an great investor, author and respected financial commentator. He is a regular guest on different TV programs like these of Barron's, FT, Wall Street Journal, New York Times, Fortune and CNBC. Rogers is the president of Rogers Holdings and Beeland Interests. James Beeland Rogers is an American investor and author. He is currently based in Singapore. Rogers is the Chairman of Rogers Holdings and Beeland Interests, Inc. He was the co-founder of the Quantum Fund with George Soros. During the next 10 years, the portfolio gained 4200%, while the S&P 500 rose less than 50%. Rogers then decided to retire – at age 37. He is the creator of the Rogers International Commodities Index (RICI). In 1990-1992, Jim Rogers fulfilled his lifelong dream: motorcycling 100,000 miles across six continents, a feat that landed him in the Guinness Book of World Records. As a private investor, he constantly analyzed the countries through which he traveled for investment ideas. Jim Rogers is well known in the investment arena as a prophet with hundreds accurate views on economic and investment events. The material and information should not be viewed either as sales material or as research. They do not constitute an offer to buy or sell any securities at any given price. No representation or warranty, either express or implied, is provided in relation to the accuracy, completeness, reliability or appropriateness of the information, methodology and any derived price contained within this material.